Sorby's 6" Inside/Outside Callipers are used for measuring internal diameters. Sorby's 7" Double Ended Callipers are used for replicating dimensions or ensuring consistent wall thickness. 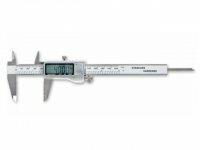 Sorby's 8 1/2" Inside/Outside Callipers are used for measuring internal diameters. A robust tool used to mark the centre of work up to approximately 8" (200mm) diameter. It may also be used on square section timber.